How did you come up with The Pickled Pig? In 2013 I started making dog treats—smoked beef bones. It was the easiest thing to get permits for. At the time, I was a private chef and had this commercial kitchen. I would make treats and set up a table at dog rescue events. It just took off from there. What are your plans for a brick-and-mortar location? We’re getting funds together to remodel a building we’ve recently purchased in Walnut Hills. We’re going to have a small, from-scratch deli. It’ll specialize in these pickled items and smoked meats—primarily pork and chicken—and then your basic deli items [like] soups and sandwiches. What is your pickling process? I pickle using the fermentation method. There’s no vinegar, it’s all naturally soured. It’s all lactic acid, that’s where you get the sourness from. It’s full of probiotic bacteria and all kinds of health benefits. 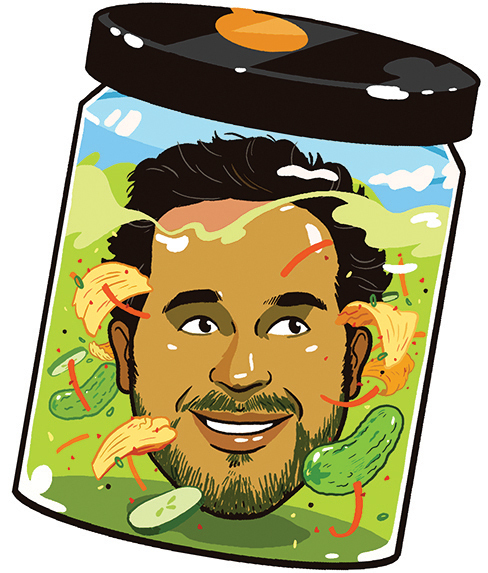 Any favorite foods to pickle? Sauerkraut is delicious. I make an awesome kimchi. It’s a Korean preparation of fermentation. Cabbage, carrots—you can “kimchi” all kinds of vegetables.